The city of Bellevue recently weighed the need to pay for animal shelter services against the need to fulfill payment obligations to staff members at City Hall, and decided to favor the staff. 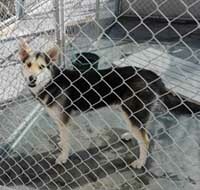 The council voted on Thursday, June 23, to allocate $3,000 of $5,200 requested by the Animal Shelter of the Wood River Valley for dog impound services for fiscal year 2012. Jo-Anne Dixon, the shelter's executive director, made the request based on the cost of impounding 37 unclaimed dogs from Bellevue in 2009. Dixon said she had heard many "hard-luck" stories from pet owners who had given up pets because they had lost their homes. Dogs left unclaimed at the shelter for more than seven days register a bill for the city of $20 per day, or $140. The dogs then become wards of the "no-kill" shelter, which then tries to get them adopted. Only vicious or terminally ill dogs are euthanized at the facility, Dixon said. Dixon said the shelter provides a free spay-neuter program and a pet-licensing promotional program. She said the facility is funded primarily by private donations and serves all cites and county areas in the Wood River Valley. "We are a private organization that provides a public service," Dixon said. But the City Council agreed to contribute only $3,000 for the upcoming year, choosing instead to increase pay allowances for city staff, who have seen cutbacks in hours and benefits since the beginning of the recession. "None of us are at 40-hour work weeks," said city Planning Director Craig Eckles. "This is the fourth year with no cost-of-living increase. There is little in the way of retirement. "I know the animal shelter looks good, but this is our retirement. This is our paychecks." Eckles said that because the Animal Shelter of the Wood River Valley has a status as a "no-kill" shelter, unwanted pets have sometimes been left in the city by people living in communities to the south. - Park fees were waived for showings of outdoor movies in Memorial Park and for the Labor Day celebration, but were not granted for the Alcoholics Anonymous Survivors Group after Councilman Larry Plott pointed out the organization's traditions that they "neither seek nor accept outside contributions." - The Fire Department began training two new fire firefighters. - Public Works Director George Tanner asked council members to tell him where potholes existed in the city that still need to be filled.